What started off as a glimmer in the eyes of us Penguin fans ended in typical dramatic fashion. Despite the comeback efforts of Crosby and company, it wasn't enough to overcome the mistakes made earlier in the game. 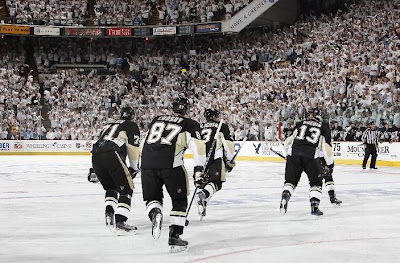 As a result the Pens find themselves down a game surrendering the importance of home ice. The game was ultimately back and forth throughout. Just over three minutes into the game we saw the Pens powerplay make good use and get a goal scored by none other than Geno Malking to put the Pens up 1-0. That sparked a very physical effort on behalf of the Pens to get the Sens out of sync and unable to get anything going. However just past the eight minute mark Peter Regin redeems himself (from taking the penalty resulting in Geno's goal) by catching a juicy fish-like rebound in front of the net to tie the game. It was at this point the Pens began to look flat. I'm guessing the energy put forth to start the game began to set in. Guys were missing their assignments. The defense turned the puck over. Passing started to look difficult. The tables were turned and now the Pens looked out of sync. Just over five minutes left to go in the period the Pens let a second goal in by Chris Neil to find themselves about to head into the second period down a goal. If you watch the goal you'll see a disembodied Alex Goligoski seemingly get screened out of the play which allowed Neil to lift it over Fleury's left shoulder. Who do you blame for this, Fleury or Gogo. Well, both in my opinion. But like I said on twitter earlier, there would be a lot less conversation surrounding Fleury's inconsistencies if Gogo would do his job. The problem is that's not Goligoski's game. He's an undersized offensive defenseman. That's it. 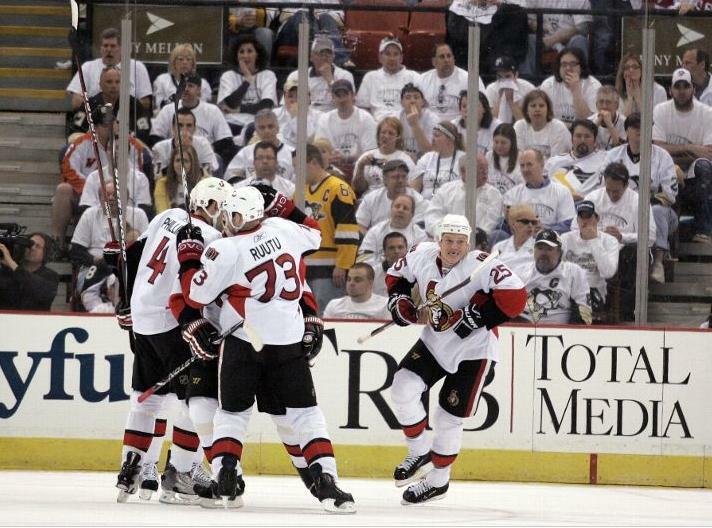 With the one goal deficit the Penguins knew that the next goal in a 2-1 game changes everything. Well, it wasn't their night. Coming into the period a man down the Sens took advantage and scored a powerplay goal to go up 3-1. Though this was result of a bad bounce off the boards. So again, do we blame Fleury for being out of the net? Well, he tends to play out of the net a little more than I'd like, but the play was routine. Ultimately the goal was a freebie for the Senators and we were on the curse side of the hockey gods decision From there on it was simply back and forth. We scored, they scored, we scored, they scored, we scored...but it was too late. Should the Ruutu goal have happened? No, that was too easy, and yes Fleury should have stopped it. And despite showing up late and making a dramatic push at the end the Pens ultimately paid for their own sins and took a game 1 loss. So what now? 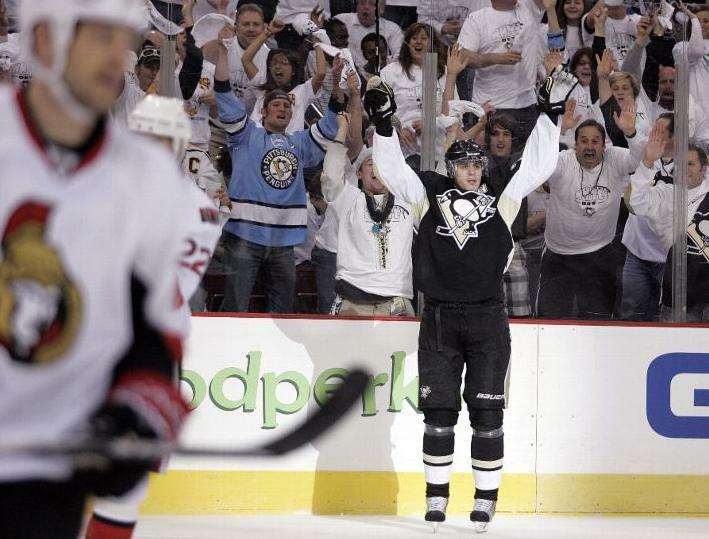 The Pens are now down in a series they are generally considered to win in 5-6 games. On paper it sounds like they're right on track. Would I consider game 2 a must win? I would. Because the last thing you want to do is lose the first two games on home ice and head to the enemies lair. However there's no need to press the panic button. I'm sure Bylsma and the rest of the Pens coaching staff is having a talk as I right this with their disappointment in their effort. At times they showed signs of life similar to that of last years playoff run. Malkin decided it was time to defend the Conn Smythe trophy with pride netting two goals of his own. Craig Adams also put in some great play and even netted his first goal in over 100 games with a little over 7 minutes of ice time. I would have liked to see some better efforts from Letang, Goligoski, Ponikarovski, and even Sid. I sometimes think Sid doesn't even know how good he is. If he wanted to take over a game he could, and he can, and I think he will. For those looking for bridges and hating on your own team I can only say this: A true fan supports his team through the thick and thin. Tonight we saw the thin. That's okay, there's plenty of time left; plenty of games to be played. Yes, I just used a semi-colon in its proper grammatical usage. Either way, if your a bandwagon fan or the most loyal one on earth, do this: Trust in your team. Trust in your players. Trust in your coaching staff. Its early, better days are ahead.